Update, May 13: Last night, at approximately 10 p.m., an adult male cougar was trapped in the Deschutes River Woods area. The cougar was euthanized a short time later. According to ODFW biologist Steven George, the cougar was in excellent condition, weighed approximately 120 pounds and was probably two to three years old. Earlier reports indicated that there were two cougars in the area. However, Wildlife Services officials investigated the area and only found tracks from one male cougar. Residents should continue to use extra safety precautions with livestock, pets, and children for the next couple of weeks. [May 12] BEND, Ore.—ODFW and USDA Wildlife Services are working to trap a cougar that has been seen multiple times in the Deschutes River Woods neighborhood in south Bend over the past several weeks. The young cougar is considered a human safety risk because it has been seen repeatedly in a residential area during daylight hours. 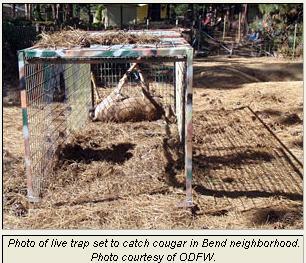 In keeping with ODFW policies, once trapped, the cougar will be euthanized. Last week (evening of May 6), Deschutes County law enforcement deputies shot at the cougar but it is not clear if the animal was hit. The cougar was seen last night about 10 p.m. and did not show signs of being injured. Cougar sightings are not uncommon in the neighborhood, which is an outlying subdivision with forests and deer that give cougars cover and prey. ODFW believes the cougar is spending most of its time along the Deschutes River corridor and coming into the subdivision to hunt. * Be aware of any wildlife corridors or places where deer or elk concentrate; cougars could be there too. * Keep pets indoors at dawn and dusk. Shelter them for the night. * Be more cautious at dawn and dusk when cougars are most active. * Leave the animal a way to escape. Cougars often will retreat if given the opportunity. * Stay calm and stand your ground. * Maintain direct eye contact. * Pick up children, but do so without bending down or turning your back on the cougar. * Do not run. Running triggers a chase response in cougars, which could lead to an attack. * Raise your voice and speak firmly. * If the cougar seems aggressive, raise your arms to make yourself look larger and clap your hands. * In the very unusual event that a cougar attacks you, fight back with rocks, sticks, tools or any items available. 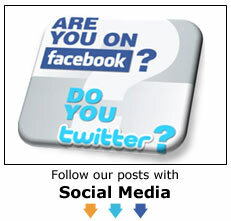 More information is available on ODFW’s Living with Cougars webpage.